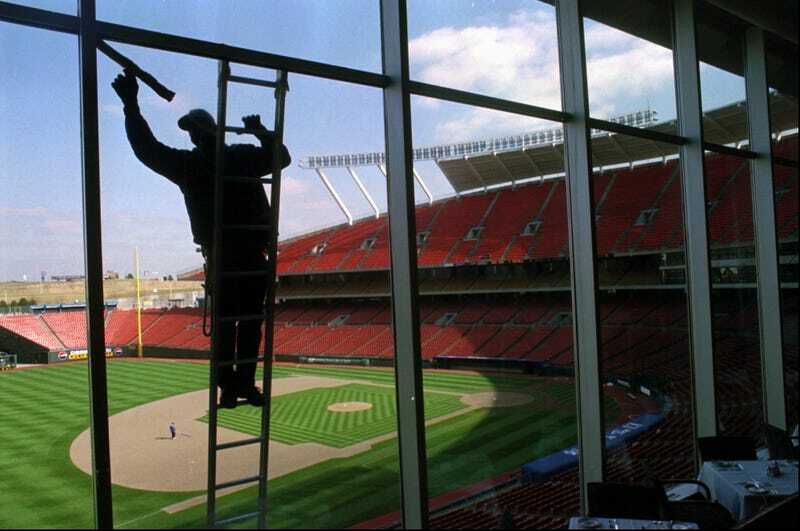 The Royals Are Hiring A Window Washer: "Must Not Be Afraid Of Heights"
Via Baseball Prospectus's Ben Lindbergh, this excellent job posting for which we are already updating our resumés. The Royals are seeking a new window cleaner, and the job consists of all the excitement a window cleaner could hope for. Applies and removes cleaning solutions to glass and similar surfaces throughout the stadium using tools including scrubbers, brushes, chamois, squeegees, scrapers, poles, and sponges, etc. 2. Do you have experience repelling off building to clean windows? 3. Do you have at least 2 years of window cleaning experience? 4. Are you at least 18 years old? 5. Are you able to work flexible hours including weekends, evenings and holidays? 6. Are you able to walk and stand for long periods of time and maneuver stairs? 7. If we stuck you in right, could you put up a WAR better than -1.9 and a UZR above -17.7?